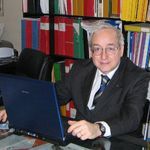 Stefano Govoni since 1974 has worked in the field of Neurobiology and Neuropharmacology. In the field of Alzheimer Research he has contributed with molecular biology studies to define the pharmacology of the amyloid protein precursor working on tissues from affected patients. Presently he is involved in research programs studying biomarkers of the disease in man and the physiological/pathological roles of Beta amyloid in animal models. 1. Mura E, Lanni C, Preda S, Pistoia F, Sarà M, Racchi M, Schettini G, Marchi M, Govoni S. (2010) Beta-amyloid: a disease target or a synaptic regulator affecting age-related neurotransmitter changes? Curr Pharm Des. 16(6):672-83. 2. Colaianna M, Tucci P, Zotti M, Morgese MG, Schiavone S, Govoni S, Cuomo V, Trabace L. (2010) Soluble beta amyloid(1-42): a critical player in producing behavioural and biochemical changes evoking depressive-related state? Br J Pharmacol. 159(8):1704-15. 3. Mura E, Preda S, Govoni S, Lanni C, Trabace L, Grilli M, Lagomarsino F, Pittaluga A, Marchi M. (2010) Specific neuromodulatory actions of amyloid-beta on dopamine release in rat nucleus accumbens and caudate putamen. J Alzheimers Dis. 19(3):1041-53. 4. Grilli M, Lagomarsino F, Zappettini S, Preda S, Mura E, Govoni S, Marchi M. (2010) Specific inhibitory effect of amyloid-beta on presynaptic muscarinic receptor subtypes modulating neurotransmitter release in the rat nucleus accumbens. Neuroscience. 167(2):482-9. 5. Schettini G, Govoni S, Racchi M, Rodriguez G. (2010) Phosphorylation of APP-CTF-AICD domains and interaction with adaptor proteins: signal transduction and/or transcriptional role--relevance for Alzheimer pathology. J Neurochem. 115(6):1299-308. 6. Pistoia F, Mura E, Govoni S, Fini M, Sarà M. (2010) Awakenings and awareness recovery in disorders of consciousness: is there a role for drugs? CNS Drugs. 24(8):625-38. 7. Rossi D, Amadio M, Carnevale Baraglia A, Azzolina O, Ratti A, Govoni S, Pascale A, Collina S. (2009) Discovery of small peptides derived from embryonic lethal abnormal vision proteins structure showing RNA-stabilizing properties. J Med Chem. 52(16):5017-9. 8. Pascale A, Amadio M, Caffino L, Racagni G, Govoni S, Fumagalli (2011) F. ELAV-GAP43 pathway activation following combined exposure to cocaine and stress. Psychopharmacology (Berl). 2011 Jan 7. [Epub ahead of print]. The observation that beta amyloid, is the product of the normal cellular metabolism, and that the peptide is present in the CSF and plasma of healthy subjects leads to the concept that beta amyloid might have physiologycal roles differing from those observed in pathology. In particular beta amyloid might have a role in the modulation of normal synaptic activities. Recent data published by our group confirmed such an effect of beta amyloid. Using both an in vivo and in vitro approach we observed a selective inhibitory effect of beta-amyloid on those muscarinic receptor subtypes which have an excitatory effect on neurotransmitter release. Accordingly,the changes of the modulatory activity of beta amyloid due to an increased production or to an altered ratio between the 1-40/1-42 isoforms within the aging process or because of the illness might in turn induce important derangements of synaptic activity. Within this context the effects of beta amyloid on the nicotinic cholinergic control of excitatory glutamatergic nerve terminals has not been adequately studied in the various brain areas and, in particular, in the hippocampus. And yet, the latter is a particularly relevant area at the border between memory circuits and neurodegenerative phenomena. Taking into consideration these observations, the goals of the research will be the following: a) characterization of the in vivo and in vitro effect of beta amyloid on glutamate (GLU), aspartate (ASP) and GABA release in hippocampus; b) evaluation of beta-amyloid effect on signal transduction machinery downstream presynaptic receptors controlling neurotransmitter releas. These aims will be pursued by means of in vivo studies using the microdialysis technique coupled to HPLC with electrochemical/fluorimetric detection and in vitro using radiolabeleld superfused synaptosomes. ELAV (Embryonic Lethal Abnormal Vision) proteins are able to stabilize several target mRNAs, positively regulating the amounts of the expressed proteins. Our group has previously demonstrated that ELAV proteins are important in brain plasticity during memory trace formation and that are impaired in Alzheimer’s disease. The aim of the project in collaboration with a pharmaceutical chemistry research group will be to develop and test pseudo peptides having the potential to mimic/inhibit the activity of ELAV proteins. Such compounds may have pleiotropic effects in cells/tissues exposed to various stimuli or noxae.